We would not be able to serve senior citizens without the generosity of donors and volunteers. From facility improvements to transportation, your giving helps provide our residents with premium long-term nursing care services in Aurora, IL. We greatly appreciate any assistance you are interested in provide so we can provide continuous care for seniors. In the delivery of our nursing care services, we collaborate with hospice organizations, physical and occupational therapy providers, and physicians. We seek additional community collaborations to strengthen our mission in caring for our seniors. If you would like to know more about our partnerships or if you would like to become one of our partners, call us for more information. As we work diligently to keep our reasonable rates, we look to fundraising and grants to help us with larger facility improvements. 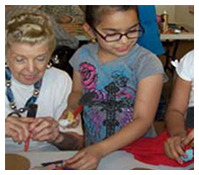 Since 1958, the Auxiliary annually conducts two major fundraisers: the summer Ice Cream Social and the Fall Bazaar. We extend our Annual Campaign & Wish List mailing to current and past families, vendors, and area businesses. Grantmakers have recently helped us improve our showers for assisted services, purchase a 12-passenger courtesy van with lift, improve our nursing bathing station with a spa tub, and replace our 23,000-square-foot roof on our nursing facility. In addition to our volunteer Board of Trustees, Jennings most significant relationship is with our Auxiliary of volunteers. Established in 1958, the Jennings Terrace Auxiliary has been the fundraising and volunteer support of Jennings Terrace. 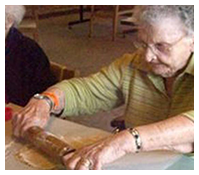 Other volunteers provide entertainment, pet therapy, transportation, and social activities for our residents. Without volunteer support, Jennings Terrace would not be able to maintain our affordable rates.